Sergey Sargsyan was born in Yerevan. From 2010 to 2012 he studied academic singing at Yerevan State Institute of Theatre and Cinematography with professor Romela Grigoryan. In 2012 he was admitted to the Vocal-Theoretical Faculty of Komitas State Conservatory of Yerevan, studying with professor Valery Harutiunov. 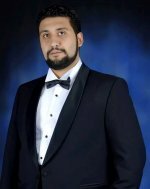 Currently Sergey is a soloist of the Armenian National Academic Theatre of Opera and Ballet and has already performed two significant roles – Don Basilio in Rossini’s Il Barbiere di Seviglia and Mustapha in von Wilderer’s Armenian Opera. Sergey’s performing experience is considerable. In 2012 he participated in the commemorative concert dedicated to the famous Armenian soprano Gohar Gasparyan and gave a solo recital at the Aram Khachaturian Museum. In 2013 he participated in the 200th anniversary concert of Giuseppe Verdi in Yerevan and in 2014 appeared with the Saint Etchmiadzin Cathedral Choir. Sergey is a prizewinner of several international competitions. In 2013 he won the Nodar Gabunia International Classical Music Competition in Tbilisi (Georgia). The year 2014 was particularly successful – he received a Diploma and Special Prize for the best performance of Banquo’s aria from Verdi’s Macbeth in the International Young Opera Singers' Competition Opera Without Borders in Krasnodar (Russia). He also received the 1st prize at the opera competition founded by the President of Armenia and was a semi-finalist of two prestigious competitions – the Montserrat Caballé International Singing Competition in Saragossa (Spain) and Ottavio Zino International Opera Competition in Rome (Italy).